One of the special things about our industry is how intellectually generous many of the leading participants are (no, I don’t mean me.) When I arrived in Silicon Valley in Jan 1994, I sought out all of the written material I could on startups and venture capital. I found exactly two books. An excellent but dry financial analysis of startup returns, and an excellent but dated book by Gordon Bell. 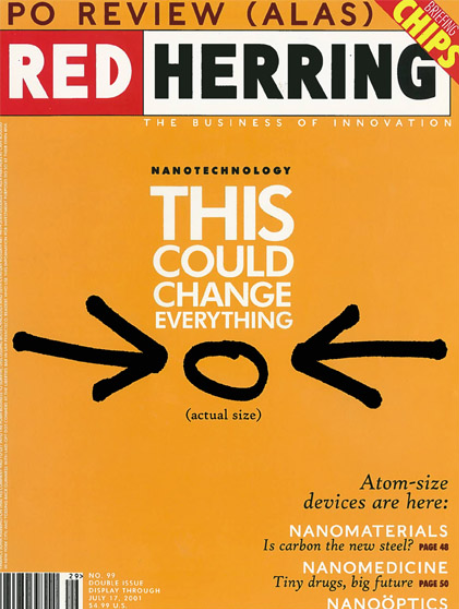 So then I looked for magazines, and found exactly one: Red Herring. Which for several years was the best magazine about startups. But, in 1994, Red Herring was ~8 (?) memographed pages, cost $12 (? ), published every 2 months (? ), and available at only a few newsstands. That was it. I knew there was more material at Stanford and Harvard business schools but I couldn’t get to it. There was nothing else. Today, 20 years later, the difference is *profound*. Many of the leading theorists and practitioners share *huge* amounts of info for free. That’s a big difference in Silicon Valley, but what I hear every day from people all over the world is what a big difference it’s making everywhere else. A 14-year-old kid in Indonesia w/smartphone has access to 10,000x more info on tech and startups today than I did in Palo Alto 20 years ago and the cycle is closing: there is startlingly profound new thinking happening all over the world and coming right back to Silicon Valley. In our industry, it’s hard to underestimate the consequences of a positive feedback loop and this is a positive feedback loop. Assumption *must* be: Tech entrepreneurship all over the world is going to expand a thousand fold in the next 20 years. How could it not? @pmarca the Internet and literacy doesn't just speed up human and IT networks: it densifies them. That density is more important.